This dapper twosome are Thomas and Ted Dawkins, brothers of my grandfather, John Campbell Dawkins. Thomas married Susan and their first child, named Thomas Charles (after his father and grandfather) died when just a baby. My great grandmother, Fanny Dawkins was "present at the death." I was so pleased to see, from the 1911 Census, that Thomas and Susan went on to have more children. I suppose every family historian possesses a tantalising photograph like this one. Found among my Great-Aunt Ada's effects, on her death, nobody can identify this Mystery Man! However, it would seem there must be some kind of family connection or why did Great Aunt Ada keep this photo? Making assumptions - or wild guesses - is frowned upon in genealogical circles but I wonder? Could this be a photograph of George Wilde, the first husband of my great grandmother, Sophia? George Wilde was a travelling musician who, according to family folklore, performed on stage with celebrated Music Hall artist Little Tich. I have searched for any references to him in theatrical publications of the time but without any luck. The Mystery Man has a theatrical air about him - could he be Geoge Wilde? And will I ever know?! I've written about my great grandmother, Fanny Dawkins, already (see below) and here is a document which throws a little more light on her life. Apparently it is a permit which was issued to Fanny so that she could visit her son-in-law who was working on the Isle of Wight during the war. This bears out, for me, the feeling I have always had about her - that she was a "rock" for her family, the one on whom everybody relied. But what I love most is that there is a description to go with the photograph. So now I know that this great grandmother of mine was 5 foot 3 inches - just a couple of inches shorter than me - and that she had grey hair and grey eyes. She was also, as the permit unkindly reveals, "stout". I love it! 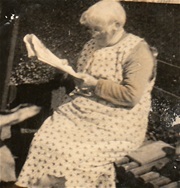 This pensive-looking woman is another relative I never knew, my great-aunt, Emma Dawkins, known as Emmie. She is a bit of a mystery to me and I want to find out more about her. Here is what I know so far: Emma was born in about 1881 to Thomas Charles and Fanny Dawkins (NB information about Fanny Dawkins was posted earlier on this page.) She was the older sister of my grandfather, John Campbell Dawkins. Family folklore says that she was a very clever woman, that she had a "good job" at a time when that was unusual for a woman, and that she died early. The complication arises from my mother's handwritten story of her early life where she talks about how she and her sister, also named Emma, had to give up their bedroom so that her father's sister could be nursed up until her death. (She recounts how fiercely they hated the fact that she died in their bed!) Now I am pretty sure this must have been Emma but the information I have been given is that she died in 1908 - and my mother wasn 't born until 1912. Like so much of family history, it's a puzzle just waiting to be solved! This rather sweet-looking old lady is my great-grandmother, Sophia Atkin-Roden. It is the only picture I have of her - but through my family history research I have gathered some tantalising glimpses into a fascinating life. Sophia was born in around 1850 in Sheffield and married German-born George Wild, a travelling musician in 1871 when she was 19 years old. Sophia was also a musician, as was her father - did she meet George on stage? Did they perform on stage as a couple? Sophia and George had four sons together - but clearly something happened between the two for on my grandmother, Rose Wilde's birth certificate, there is a space where the name of her father should be. Sophia died at the grand old age of 87 in 1938. My Uncle Roy remembered her funeral - complete with a glass coach drawn by four black horses with white plumes. So perhaps at the very end of her days Sophia was true to her theatrical roots! This is the telegram we sent to my sister, Maggie and her husband, Barrie, to announce the birth of our son Steven on February 11th 1973. Perhaps the excited wording was something to do with the fact that we already had three darling daughters. Barrie, who found this telegram a few days ago (what a hoarder!) was to become Steven's godfather. This photograph of my mother, Doris Usher, sums up for me what it was like for women without their men during the Second World War. My mother is pictured on the right, with her sons Tony (then aged about 5) and Phillip (about 9 months old). Also in the picture are her sister Sylvie (the older of the two young girls in the picture) and her sister-in-law, my Aunt Clara, with her daughter Vivienne. My mother was evacuated to Wales during the war and was billeted on an elderly woman who told her she had to leave when her baby was born. My mother, uncomplaining, wrote: "I don't blame her, she was too old to have people billeted on her anyway, and a new baby is unpredictable." The story is told in my mother's booklet: "War and Me". If you would like a copy, leave me a comment with your email. Uncle George was my father's older brother. He and my father attended the same school, the Davenant School in London. My father wrote about his early school-days: "I found that the other boys did not bully me and then I realised that this was because George was my brother and George was a hero to the other boys in the school." My sister Maggie and I loved this photo of our mother, Doris, aged about two - pictured left in this photo. We were so pleased that she wore the prettiest bonnet. The photograph was probably taken around 1916 to be sent to my grandfather, John Campbell Dawkins, who was serving in the Great War at that time - one of the so-called "Old Contemptibles". I believe that this photograph was taken in about 1918, shortly after the death of my grandmother Clara Usher (nee Waterlow) in the flu pandemic of that year. She was just 31 years old. I have been told that my grandfather had this photograph taken because he feared he would have to put his three children in the workhouse, following the death of their mother. It may explain why he looks so stern - he was actually the kindest, most gentle man you could hope to meet. Fortunately he was able to keep his family together. My father (the cheeky little one in this photo) adored his father. This is a photo of my great grandmother, Fanny Dawkins (nee Coney) taken about 1890. I believe the photograph was taken to mark the death of her husband, Thomas Charles Dawkins - she is wearing what were known as "widow's weeds" (her black head-dress) and on her finger you can clearly see her mourning ring. These mourning rings - a wedding band edged in black - were often worn in Victorian times. I am trying to track down family history also, my great grandfather was Thomas Henry Usher from Bogantungan Queensland Australia. Was grandfather, George Alfred Usher a son of William Usher & Mary Ann Nash, my great grandparents? Hi, Colin - yes, that's right - William and Mary Ann are my great grandparents too. There's lots of great information on your website - thanks for the link. That's so true, Pip! And my sister and her husband weren't even on the phone in those days so a telegram was the only way to reach them!